Time to move on. No, I haven't actually resolved all of my issues with getting Ubuntu Linux to display the way I would like it to on my external monitor, but I have wasted enough time toying with that, and frankly it's giving me a migraine. So, in fairness to Linux, I am switching gears. One quick thing, though, about the Unity interface. I discovered while playing with it, that Unity mimics the Aero Snap features of Windows 7. You can drag windows to the left or right to automatically snap them to one side of the display, or drag it up to maximize it. It may not be a big deal to many, but I really like and use the Aero Snap feature in Windows 7, so that would help me work more efficiently in Ubuntu as well. But, as many comments pointed out, Unity is still rough around the edges. Consequently, many recommended that I avoid the Unity interface. As much as I am a fan of bells and whistles, I decided to take that advice for now and switch back to the Ubuntu Classic desktop. I may circle back and play with Unity some more later, but it is not necessarily a crucial element of the 30 Days With Ubuntu Linux project. I typed in my name and email address to start the process of setting up my email. OK. Back to gear switching. 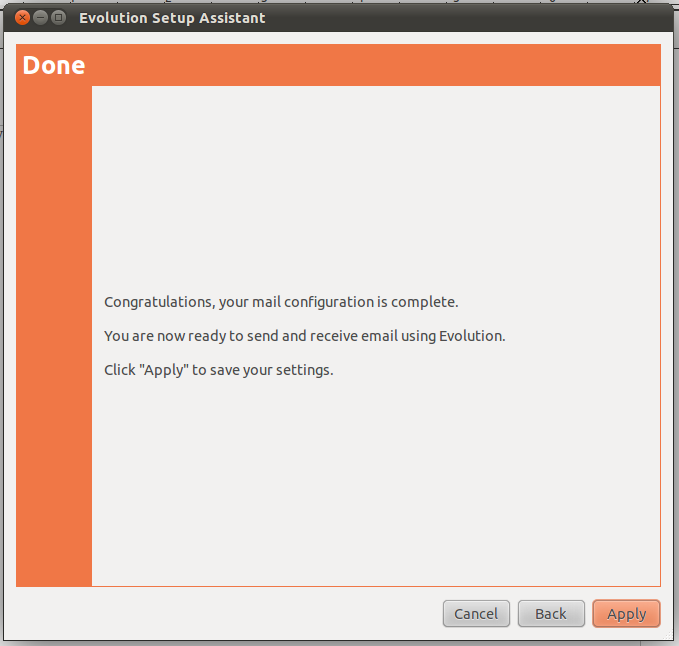 I have my email accounts set up within Gmail, so I have been able to get my mail that way-but, I don't actually like using Webmail, so I decided to set up the email client that is installed by default with Ubuntu--Evolution. Actually, it is more than just an email client--it is similar to Microsoft Outlook in scope, with mail, calendar, contacts, and more. I clicked on the Messaging Menu at the upper right of the display and selected Set Up Mail. I was greeted with a Welcome screen to start walking through the process. After clicking Forward, I was given an opportunity to restore Evolution from backup--in cases where you might have your mail, calendars, contacts, and other info backed up. But, I am starting from scratch, so I just clicked Forward again. On the Identity screen, I typed in my name and email address. Under the Optional Information, I typed my email address again, but I am pretty sure it would have defaulted to that, and my typing it was unnecessary--hence it being "optional". The next screen let me input the details for my incoming mail server, and my username. Evolution defaults to using IMAP, but offers a variety of server types to choose from--including POP. I configured my email encryption and authentication options, and clicked Forward once again to set up other options like how often to check for new messages, and whether or not to filter out spam, among other things. A few simple screens later, my email was set up and I was ready to roll. After entering essentially the same information for my outbound mail server, and giving the email account a name, I clicked the Apply button, and voila! Evolution opened up, asked for my email account password, and retrieved my messages. As I said, Evolution also has contacts, calendar, and other functions as well. 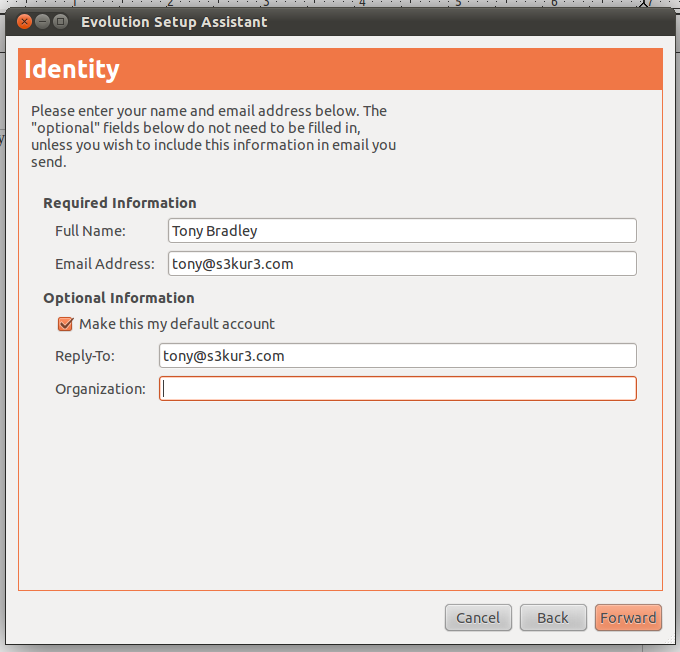 Next, I will have to figure out how to import my contacts and calendar events into Evolution. Not too exciting. But, now I don't have to use Webmail. As a side note to Linux users following along--you know the OS better than I. Feel free to let me know in the comments what you like about Linux as an OS, and offer up suggestions for tasks or tools I should check out during the 30 Days project to make sure I see all it has to offer.